My 3rd Award which I was tagged for by Angelica @ The book Cover Girl. Thanks a million Angelica <3. 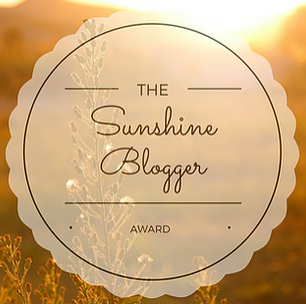 This award “is given to bloggers who are positive, inspiring and bring some sunshine into people’s lives.” I hope that I do give some positivity in this amazing community! -What’s your favorite blog post you’ve ever written? I am still a new blogger and I don’t know if there is a post that I like more than the other posts up to this moment. I continue trying to improve the posts and the banners so I like them all equally by this moment. -What is your favorite blog post (not your own) that you’ve ever read? -If you could meet one author, dead or alive, who would it be? -What is the worst book you’ve read this year? -What’s your favorite book quote? -Who is your favorite super-villain? -If you could bring any fictional object (weapon, clothing, food etc.) into the real world, what would it be? -What TV show have you binge-watched lately? It has been a while since I watched a TV series, the latest however was Game of Thrones -all 7 seasons- which I binged in 1 and a half months. -If you were writing a novel, what would it be about? -Your bookshelf is on fire (God forbid!) which one book do you save from the flames? Why that one? Most probably Six of Crows because it is my favorite book of all time. Probably most of my friends have done this tag, I am not going to check out this time individually. But I am going to tag people who genuinely are positive and I am happy whenever I see their posts. Thank you for the nomination! ❤️ And it’s so cool that you’re writing a novel! The premise sounds really interesting. I am so happy that you find it interesting because I need motivation to write it. that sounds like a great idea, and I think I will do it but after I do a bit more progress because I am doing it in baby steps. Do you know what your story will be about? Thanks for the nomination! I don’t know which book I would save of my bookshelf was on fire. I’d go for all of them! Loved reading through your answers! Six of Crows is definitely amongst my favorite books. I think I’d try to save my Leigh Bardugo collection if I could in that situation. And that Cinderella retelling sounds super interesting! Good luck with your novel writing! i think I will try to save them all if I could but they wanted only one! Yes, I have thought of an outline but I can’t decide if I am gonna keep it contemporary or add some fantasy elements. And I also keep feeling that the story is not of my own and someone has already done it before. It’s just hard to proceed. lol, I will be an author and you can be my critic! Thanks for the nomination Hamad! I’m very intrigued on the story you are writing, I could see how that could be done well. Hamad thank you thank you thank you so much for tagging me. You’d be the first to ever tag me in this kind of thing so thank you!! LOL genie lamp such a great idea, and wait what? You’re writing a novel WOW and it sounds so promising. Good luck on that!!! I hope to be able to write it as everone's encouraging and they want to read it! I absolutely want to read it. That book idea sounds great! !